Any designer knows that the line between math and art is blurred. Architecture, paintings and nature all follow the same mathematical formula for beauty! The golden ratio or Phi (1.618) is a mathematical formula for beauty, symmetry, and balance. This formula can also be applied to makeup artistry. Here is how you can use the golden ratio to create a cat-eye makeup effect to perfectly fit your own unique features! I recommend using Tarte Cosmetics not only because of the quality of their products, but because they are free of parabens, petro-chemicals, phthalates, sulfates, and synthetic fragrances. Plus, they do not test on animals. Place one end of the pencil on the outer edge of your nose and the other end at the outer tip of you eyebrows. This will serve as a guide for you to use when drawing a thin line from the outer edge of your lid up towards the outer edge of your eyebrow using the thin brush and liquid liner. Draw the line as long or short as you wish depending on the look you want to create. Fill in the line with one sweeping motion from the tip of the line towards the outer corner of the eye. Keep your eye open and place a small mark on your upper lash line directly above your pupil. Close your eye and draw a second line that connects the mark above your pupil to the outer edge of the initial line. Use the brush to fill in any space between these two lines. Use the eye pencil to fill in only the lash line. Make sure you avoid drawing a thick line across the entire upper lid as this will cause you to lose the dramatic angled line you just created. You want to keep the “drama” towards the outer edge of the eye to achieve the cat-eye effect. You can also fill in the lower lash line with the eye pencil to further emphasize the eyes. Place the mascara brush at the base of your lashes and gently wiggle the brush from side to side to allow the lashes to sink into the brush. Once the lashes settle into the brush, gently sweep the brush up towards the tip of the lashes. When applying to the lashes on the outer corner, look towards your nose. Look straight down when apply to the lashes in the center of your lid. To reach the inner corner of your lashes easier, look down and away towards the outer side of your face. The beauty of this technique, is that it will create a look perfect of your unique features. 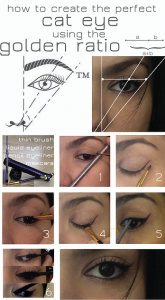 Give it a try and enjoy artistically expressing yourself through makeup while using the golden ratio!